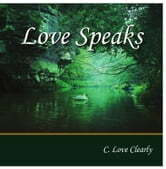 C. Love Cleary has compiled a collection of one-liners and short paragraphs that embrace the mind, call to the spirit and inspire reflection. Her words impart a fresh breeze that invites you to pause and reflect on the choices you make every single day, every single hour. Her prose provokes awareness, wakefulness and appreciation for what we already have right now. Refreshing and bracing, her words flash with vision and brightness – sometimes soothing, sometimes reassuring and comforting, and sometimes challenging and arresting.